I wanted to write a good post tonight. All the elements of a great time for writing are in place: the kids are sleeping (Nathan in his Moses basket on the couch beside me), I've got some classical music playing on the TV (to help Nathan sleep), I've got wine on the counter that is calling for me to pour a glass, and Tim won't be home from work for another hour. But I am so very, very tired. I'd forgotten how tiring it is to be woken up multiple time in the night to feed an infant, even if I do feed that infant while lying down and usually doze off while doing so. I look forward to the days when Nathan gets down to that one 4AM feeding instead of maybe doing one long stretch during the evening and then being up every 3 hours till morning. So instead of a nice post, you get this very boring little blurb of me telling me you're not getting a real post tonight. And I'm going to lay down on the couch and take a nap until Tim gets home. One week before Nathan was born, I was transferred from midwife care to the care of an OB. My platelets tend to run low while I'm pregnant, which puts me at a higher risk for postpartum hemorhage. We'd been consulting with the OB over the past eight months, but in my last month of pregnancy, the numbers dropped low enough that the official transfer became necessary, as well as a consult with a hematologist (doctor specializing in blood disorders). Unfortunately, I found out about the transfer when my midwife called me on my cell phone as I was sitting in the OB's office for a routine update appointment. Her timing could have been a little better. I was pregnant and hormonal; how else could I react but with tears? I ended up crying my way through the appointment, trying to wrap my head around how my labour and delivery experience was about to change now that I was under the care of an OB. I now hadn't the faintest idea what to expect, nor did I even really know what to do. Having been with midwives for the births of our first two children, I wasn't used to the whole concept of having to deal with hospital staff and specifying my wishes for a natural birth and all that stuff. This post isn't really about all that, but let me just say that in the end, the experience really is completely different, and I was very thankful that in the end I was able to have my midwife there at the hospital for supportive care. Back to the point. I went home from the appointment that day feeling pretty miserable and lost. All the expectations that I'd had for the birth of our third child were changing. I felt completely thrown for a loop and didn't know how to wrap my head around what was going to happen now. My plans had to change, and I was having a hard time accepting that fact. And then God came and reminded me of the truth: yes, my plans had to change, but His plans didn't. This was His plan all along, and His plans are always for my good. He knew this was going to happen the whole time, even if I didn't. He is in control, even when I feel like life is spinning around me. I found myself repeating that phrase to myself frequently over the next week before Nathan was born, "His plan, not mine." I'll be honest and say that as I look back on the whole experience, I don't really know what the good was in having to be switched to an OB as Nathan's labour and delivery was about as uncomplicated as it gets. Or then again, maybe the whole point was to learn this valuable lesson, that we can plan our lives all we want, but we are not the ones in control; it's God who plans our lives, and He always knows what to expect, even when we don't. I know. It's almost a sacrilege. 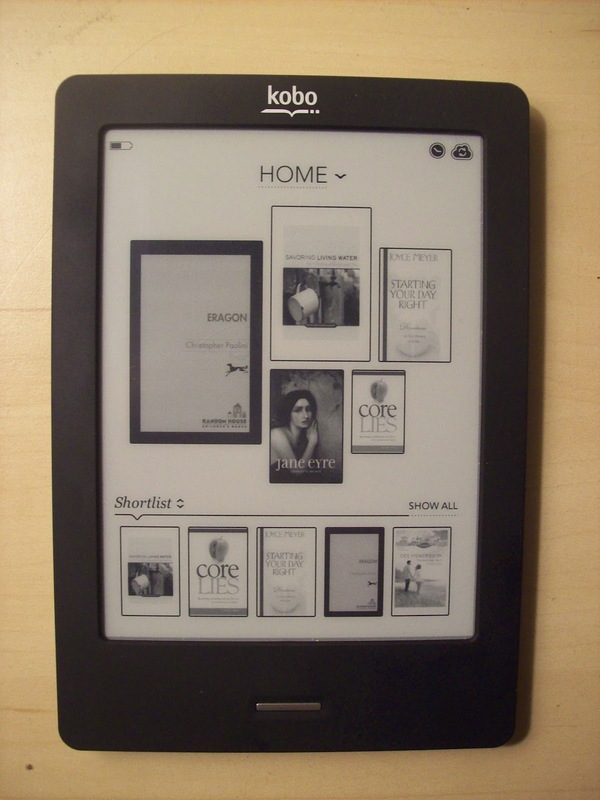 I actually bought an eReader. But before you take me out back and read me the riot act for doing something so crazy, hear me out. When you have kids, an eReader is actually extremely handy. As in, I can now borrow books from the library without leaving my house. Have you ever tried browsing the library with two small children in tow? And I mean literally in tow. The last time I tried to find a book for myself at the library, Reuben and Kaylee decided it would be a fun time to pretend that they were my new shoes. So they latched themselves onto my legs, and I had to try and walk with two cling-ons attached. Not my idea of how to find a book at the library. With my new eReader, I don't have to do this anymore. I can sit on my couch with my laptop and browse the library from the comfort of my living room. It's wonderful. Also, when you are nursing an infant, it is much easier to read when you don't need a second hand free to turn pages. In fact, I don't even have to hold the book at all. I can just leave the Kobo on my leg or on the arm of the chair or next to me on the couch and tap on it occasionally to turn the page. No more trying to awkwardly turn a page while holding a baby. No more worrying about losing my spot when I put the book down because the pages are going to flip over without me holding my spot or putting in a bookmark. Very, very handy. 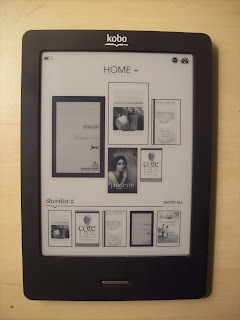 Anyway, I'm not trying to make you all go out and buy yourselves eReaders. In fact, I have no intention of changing my book purchasing habits just because I have one. There's still nothing quite like the smell of a new book, and reading a book with the actual pages in your hands is a completely different experience from reading it on an eReader. Besides which, there are many books that don't come in e-format. But at this stage in my life, I have a definite appreciation for this new technology, and I'm thrilled with my purchase so far. I have a few moments to myself, so I thought I'd take the time to see if I can get a blog post out. Nathan is sitting quietly beside me in his bouncy chair, and the other two kids are occupied playing with two older children from our church that have started coming over for a few hours on occasional afternoons. It's a great arrangement that the kids and I both love because they get somebody to play with, and I don't have to try to keep them entertained during that dead time between nap and supper. I'm discovering a couple of things. One, I'm really feeling the itch to get back into blogging more regularly again. I've had a couple of ideas for posts, some from when I was pregnant and just didn't get around to writing and some now that life is starting to go back to normal. Except that's one of the other things that I'm discovering: life has to have a new normal now that there's an infant in the house. Which leads to another discovery: it's hard to create a normal routine with an infant and two other children. I know that this shouldn't really come as a surprise, and it doesn't really. I think I'm just feeling the frustration of enjoying having some energy back now that I'm no longer pregnant, so I want to be doing so many different things, but feeling like I can't because I'm tied down to an infant schedule and still trying to deal with some serious sleep deprivation, so I need to try to conserve the energy I do have. For example, I wish I could get back to the morning routine of getting up with the kids to read blogs and write posts, but for some reason, I feel like every minute of my mornings is now taken up with just getting everybody dressed and fed. And school hasn't even started yet! I'm worried about how much more hectic mornings are going to get when I have to actually have the kids fed and dressed in time to get Reuben on the bus. Anyway, we'll cross that bridge when we get to it, and hopefully I'll have some kind of better morning routine figured out by then. But it does mean that I also don't get the blogging time in that I wish I could, and I'm not so sure it would work to switch to writing in the evenings because by the time the kids are in bed, all I want to do is crash on the couch and veg for a little while before I go to bed myself, usually at a ridiculously early hour in anticipation of being woken every three hours (or more frequently) to feed the bottomless pit that is a two-week-old infant. Actually, even writing this post now, at suppertime, feels a little strange. But maybe this needs to be the new normal? ...Nathan John, born on Tuesday, June 26, 2012 at 10:40pm. He weighed 6lb 15oz and was 20.5cm long. I got the little baby I was hoping for. :) Reuben was over 8lb, and Kaylee was 10lb; this is a huge adjustment for us. Everything with the labour and delivery went well, even though I'd been switched to OB care in my 38th week due to concerns about my platelet levels. My midwife was still present at the hospital, and I was so grateful for her help in getting me off the ridiculous monitors that the hospital seems to think is necessary. The OB resident that day seemed to think I needed to be on the monitors constantly, and therefore needed to be stuck in the hospital bed, not fun when you're trying to go naturally. I can see why so many women decide to have epidurals if that's the kind of stuff they have to put up with. Luckily, the attending OB overrode that decision, but the nurse decided not to actually take the monitors off of me even when they weren't keeping track of things. 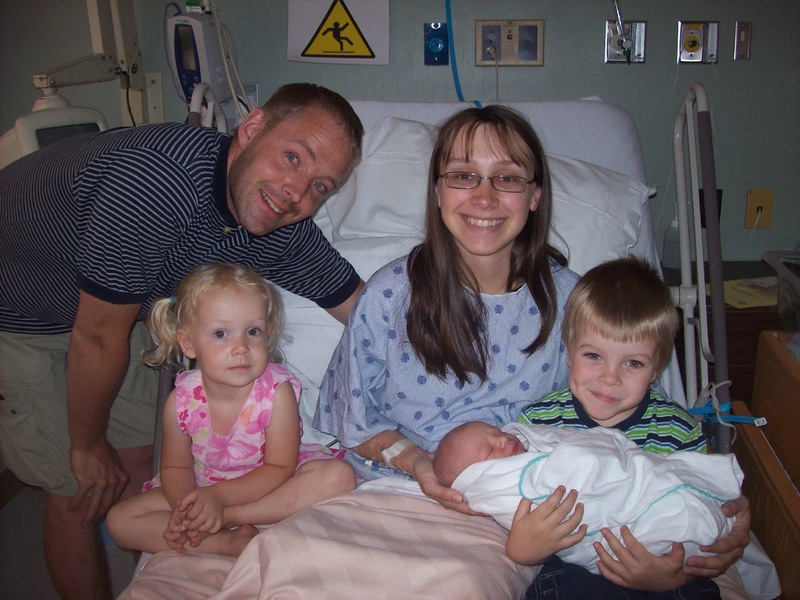 My midwife quickly put things to right when she got there, and things went much more smoothly from that point on. An hour and a half after being admitted, Nathan was born! We spent that first night in the hospital, and then my sister Laura brought Reuben and Kaylee in to visit us the next day. They are super excited to have the baby brother they were hoping for. We are all settling in nicely at home now. Tim went back to work this week, and I think I managed fairly well with just me and the three kids. Nathan seems to sleep better in the day than at night, and his nap doesn't really match up with Kaylee's, so I'm pretty sleep-deprived at this point, but otherwise, I'm starting to feel a bit like my pre-pregnant self again. That said, I have every intention of nursing Nathan for at least a year, so I'm not sure how long my brain will be stuck in that particular fog, but I'm quite certain it won't be nearly as bad as pregnancy brain. I am hoping to get back into posting a little more regularly, (when/if I can find the time), and I can already feel the creative juices slowly starting to flow again. And then again, that could be due to my renewed relationship with that faithful friend, my morning cup of coffee. Mmm, coffee. How I have missed thee!